Big Finish has grown increasingly confident in its ability to bring back lesser-known or seemingly one-note villains from Doctor Who’s long past, giving them a new lease on life and in some cases dramatically improving overall perception of them as a lasting threat. While the microscopic Nucleus of the Swarm from ‘The Invisible Enemy’ assuredly topped nobody’s list of most-wanted return villains, ‘Revenge of the Swarm’ posits that part survived the Fourth Doctor tale inside the TARDIS, now returning to Titan Base with a plan centuries in the making to become larger and more powerful than ever before with the advent of the information-carrying Hypernet which the human empire holds so dear. Of course, ‘Revenge of the Swarm’ is also the true introductory story of quasi-new companion Hector following the events with Hex in ‘Afterlife.’ Philip Olivier has consistently been one of the defining aspects of Big Finish’s Seventh Doctor adventures since Hex’s introduction, but after two completely logical and emotional ending points for the character, it seems as though Big Finish has run out of creativity with the character and is keeping him on board far beyond his natural time. It’s a nice sentiment to have Hector feel as though he could never live up to Hex, but it seems unnatural and forced that Ace would fall for Hector and insist that she can get Hex back from within after showing absolutely no romantic interest in Hex at any point. Otherwise, there is nothing in the writing or performance to really distinguish the two versions of this character, seemingly a missed opportunity that will hopefully be rectified in subsequent releases. As it is, having Hector’s mind taken over and manipulated is hardly the best introduction for this new character, especially after all of the backstory required to understand how he has come to be in this condition. Really, though, the Nucleus comes off as a campy threat with delusions of grandeur no matter how impressive the scale of its plans become, and there’s a neat point midway through the story where the Seventh Doctor sets events perfectly in motion for his earlier incarnation’s adventure, a logical point where this story could have satisfyingly ended regardless of the brevity that would entail. Then switching the story to the resulting future with the Doctor and Ace in a virtual environment does little to add to the overall tension and creates a somewhat disjointed experience even if there are some fun moments to be had within those confines. There’s nothing wrong with revisiting the Doctor’s past, but there are some villains and stories that simply don’t merit being back. Perhaps with a darker story that more adequately plays up the sinister nature of the Swarm a decent argument could be made, but ‘Revenge of the Swarm’ shares too many similarities with its predecessor before switching course to another story type that has been so successfully done many times before as well. 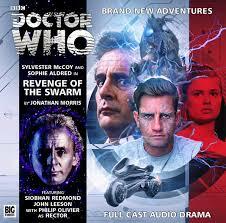 Ultimately, ‘Revenge of the Swarm’ could have worked as a concise one-part or two-part adventure, but the Swarm just doesn’t have enough menace to carry a four-part story and the story of Hector falls flat by not even allowing it to truly begin.